For most residents of America's ever-expanding big cities, construction and road-work signs are so common they barely get a passing glance. But for Cynthia Good, CEO and founder of Pink magazine, a women's business publication based in Atlanta, the "Men Working" sign on the corner of Marietta Street and Northside Drive just a few blocks from her office couldn't be ignored. In early July, city police found that someone had spray painted two extra letters, W and O, on the sign, and received a report that put Good at the scene with a can of spray paint in hand. When officers and the head of the road crew paid Good a visit, "I offered to pay for that one sign if they would agree to use gender-neutral ones," she says without actually admitting her guilt. "The head of the work crew said he had gender-neutral signs but refused to use them. No charges were filed." Her encounter with law enforcement only emboldened Good, who sent letters to city and state officials requesting that the signs be removed. In a relatively short period of time, the city of Atlanta agreed to address the issue by both buying new signs at a cost of $122 each and covering old ones for $22 each, according to a report in the Atlanta Journal-Constitution. Calls to the Atlanta Public Works department, to determine how many would be replaced and how many would be altered, were not returned. 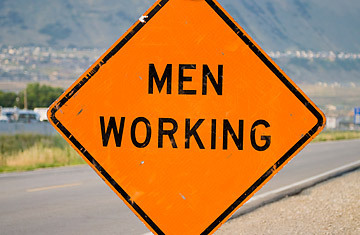 The "Men Working" sign issue isn't simply a matter of symbolism. Construction may still be an overwhelmingly dominated male field, but in 2007, according to the Bureau of Labor Statistics, about 1.1 million women were employed in it, accounting for about 9% of the total in the United States. "Signs such as 'Men at Work' unintentionally reinforce the idea that only men are suited for  and are capable of  doing outdoor physical jobs," Sherryl Kleinman, sociology professor at the University of North Carolina, Chapel Hill, wrote in an email. Once a federal government agency takes notice, though, then suddenly a spray-painted sign gains more meaning. And Good's complaints spurred a national inquiry  albeit a restrained e-mail inquiry  by the Federal Highway Administration, an agency of the U.S. Department of Transportation. An e-mail was sent to the division offices in each state to remind them to be mindful of the signs, which it turns out have been prohibited since 1988 by the Manual of Uniform Traffic Control Devices  the manual that governs federally funded "road things," as Doug Hecox, spokesperson for the FHWA puts it. "The response is we've seen none of those signs. They're not out there," Hecox says. Hecox contends that the "Men Working" signs in Atlanta are most likely an isolated incident, considering the 20-year prohibition on the "Men Working" signs. While a majority of the nation's highways and roads are owned by state, local and tribal governments, all publicly accessible roads are subject to the regulations of the MUTCD, including city roads. But those who think that the FHWA originally outlawed "Men Working" signs in an attempt to correct sexist language are sorely mistaken. In fact, historians at the FHWA explain that the signage change in 1988 was more about moving toward more easily understandable messages than making any kind of statement on sexist language. It was in fact simply part of a broader effort to make pictograms  not words  the basis of road signs. The feds had originally started to phase out the "Men Working signs" 10 years prior in 1978, when they began to be replaced with an image of a little person working on the same orange, diamond-shaped sign. "My guess is that Atlanta probably bought a bunch of signs back in the late 70s, early 80s and maybe weren't aware of the change," Hecox says. Logical as that might seem, there are likely other gender-specific signs still being used that are not subject to the regulations, because the manual regulates signage on public roadways and the right of way areas on both sides of the road but does not regulate signs used in private construction. Then again, private construction companies and contractors do purchase their signs from some of the same businesses as the FHWA division offices in each state, which might account for the signs appearing at non-federal construction sites. Still, Good doesn't regret making an issue of the few signs she found. "The sign issue is important because it is indicative of messages and signs that women receive all day, every day, on the streets, in the board room, in every aspect of their lives, especially professionally, that either ignore women or disparage women," she says.